Instant foods have become part of everyone’s life. As more brands and more choices appear, the uninteresting ingredients and mediocre tastes are the same for all of them, except one: Crystal Noodle. We are unique in our use of only the highest quality ingredients to produce the safest products. The name Crystal Noodle describes the gluten-free, thin, clear mung bean noodles. Always non-fried, our delicious flourless noodles have 0% trans fat. They’re naturally low in calories and cholesterol. 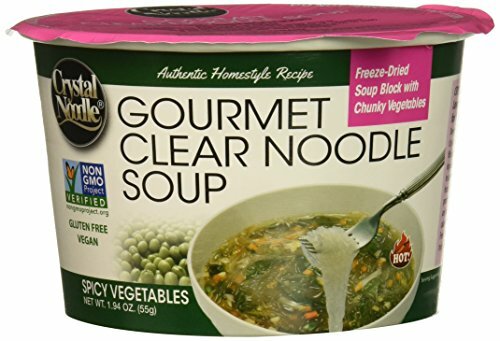 And, because of their delicate, translucent nature, they are perfect for absorbing the rich, freeze-dried flavors of Crystal Noodle Soup’s authentic recipes. If you have any questions about this product by Crystal Noodle, contact us by completing and submitting the form below. If you are looking for a specif part number, please include it with your message.